With high hopes for a find. What’s the line between collecting and hoarding? If you’re a collector, you’ll be in the Sunday supplement: a personal profile accompanied by a photograph of you, surrounded by your collection and smiling as you hold a prize specimen (teddy bears or baseball gloves, it doesn’t matter). But if you’re a hoarder, you and your home become a subject for reality TV. I cast my eyes around my living room and count the small brass bells I’ve arranged on each flat surface. I stop at 11 not because I can’t bear to continue, but because that’s all I have. Still, the bells have become a definite decorating feature. They’re “dust collectors,” my mother’s favorite word to disparage a no-longer-beloved tchotchke — or any decorative item she advised me against buying. Although I still dust them, I stopped polishing the bells long ago. Even so they look like a collection, and they are — but not mine. I bought all but one bell as a single purchase about 10 years ago at a flea market, taking advantage of someone else’s years of hunting. Though my mother’s admonition about dust collectors rang in my memory, I found the actual tinkling of the multiple bells irresistible. Except for the tiniest, which my mother rang when I was a little girl and it was time for me to wake up, I could give all the bells to my cousin to sell on EBay and never feel a pang. They could go right up there with the 3,899 brass bells currently on sale. I don’t consider the bells to be my “collection” because I didn’t have the thrill of the hunt. For me, the hunt always provided most of the fun. I’d head into antique malls, scan the shelves, pause over items “just like the one that used to be in my parents’ (kitchen/living room/bedroom),” check the price, and keep on looking. I used to go antiquing with my mother. 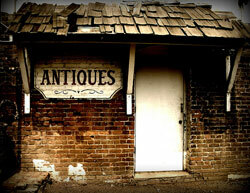 Even now, when I walk into an antique shop, my instinct is to clasp my hands behind my back. Whenever we went into one of the local shops, I’d stand and stare at a blue crystal inkwell because I liked the color: a cerulean favored by Maxfield Parrish for evening skies. So it happened that when I was eight years old I started a collection of inkwells, fitting for a writer. Ink wells. Stamps. Star Trek memorabilia. Coins. Comic books. Baseball cards. Vintage recordings. 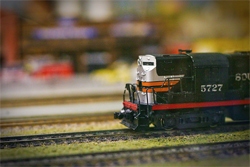 Model trains. Guns. Clocks. Hourglasses. Antique medical instruments. Snow globes. You name it, somebody collects it. Collectors form communities — and compete for unique or rare items. Visit the world of the collecting specialist and you’ll be an outsider, but if you’ve collected anything yourself you can understand the passion. But unless you’re a collector, the four old toasters on the top shelf that you’re keeping just in case you need them, those toasters are a sign that you might be crossing that invisible line. But some folks can have multiples, and they’re just collectors. During a recent trip to the Longaberger Homestead in Ohio where attendance at the special weekend ran about 2,500, I was probably the only person there who hadn’t gone with the intention of buying at least one basket. I already had one. In my living room a covered, lined Longaberger basket sits on top of a bookcase next to a bell, two souvenir snow globes, and an animated sailor-suited stuffed toy gopher that plays and sings “Anchors Aweigh.” I wasn’t taking any chances. All the women I saw wore satisfied smiles. They carried totes (gift with purchase) and large bags bulging with baskets and pottery. I asked a few women if they collected baskets; all did. How did they get started? They all either bought one basket from the hostess at a home party, or received a basket as a gift. One happy woman said that when she and her husband were moving 10 years ago, her husband came into the house from the garage and told her that he’d stopped counting her baskets when he got to 260, not because he’d finished, but because he saw no point in continuing to count the many still not tallied. And that was 10 years ago. She didn’t know how many she had now, but she still carried a full shopping bag. When she said she was thinking about selling her baskets at a yard sale, her friends laughed, and I found myself wishing I could go. Wondering how I could get to her mythical yard sale was one danger sign; I recognized a second when I asked whether a make-your-own basket was “worth” more or less than the same type signed and dated by a worker. I could feel another collection about to befall me. 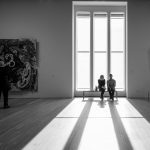 Some collections eventually grow so large they evolve into private museums open to the public a few hours a week or by appointment. These museums show up in directories of roadside attractions: Elvis memorabilia (imagine thousands of portraits of Elvis on velvet), pencil sharpeners, matchbooks, beer cans, candy wrappers. Although I have a lot of stuff, short of devoting most of my time and financial resources to the pursuit of, say, glass and china slippers or inkwells, it’s too late for me to think of opening such a museum. I might as well aspire to be a ballerina and win big time on America’s Got Talent.